Just when you thought “UFC 121: Lesnar vs. Velasquez” couldn’t get any better, enter Spike TV stage-left with the return of “UFC Prelims.” As expected, two live preliminary bouts will kick off the October 23rd extravaganza. The edgy network announced today three former “The Ultimate Fighter” contestants will participate in the hour-long lead-in show. A pair of middleweight scraps will be featured, as Patrick Cote meets Tom Lawlor in the first televised bout and TUF 11 winner Court McGee will face Ryan Jensen shortly after. 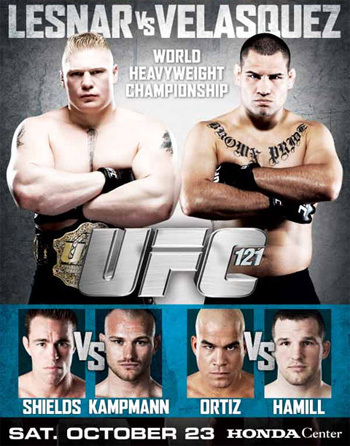 UFC 121 takes place inside the Honda Center in Anaheim, California. The freebie special airs at 9PM ET/6PM PT and will serve as a teaser to the night’s pay-per-view broadcast. The UFC first offered the teaser for UFC 103 last September to help promote the struggling fight card, and the special proved to be an effective means of generating last-minute PPV buys.